Sorry guys, this will only be a very short & brief review because I am in a bit of a hurry right now to get to a dance rehearsal. this flavor certainly lived up to its name, these crunchy pretzel sticks were loaded with rich toasted sesame flavor, although there were no whole sesame seeds covering the sticks, but that's ok because all the flavor was infused into the pretzel sticks themselves. Overall these were lip-smackingly delectable you'd crave for more, I certainly did and was kicking myself for not buying more of these during my last shopping trip to Tokyomart. 1 thing for sure is that I will definitely be getting more boxes of these rich sesame Pretz the next time I go to Tokyomart! that's it for me today, sorry for the short review, I promise I'll post a longer review next time! But right now I really need to go or I'd be late for the rehearsal! I love my 'Pretz' biscuit stick snacks & it has been a while since I last reviewed about it so today's review is going to be about another Pretz flavor, which, in my opinion, was surprisingly yummy. Sudachi is a type of Japanese citrus that can only be found in Japan, it is virtually identical in appearance, taste and use to the common lime, only it has a zestier flavor & aroma to lime and lemons. I have never tasted Sudachi before, but I have been told that like lime, Sudachi is very sour and acidic and is commonly used as a garnish on many popular japanese dishes. 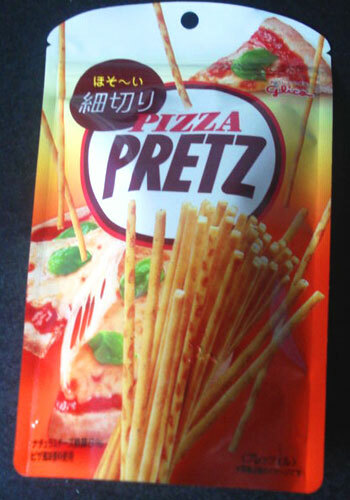 Knowing what kind of taste Sudachi has, frankly I was originally quite apprehensive about this particular sudachi Pretz, as I was a little worried about the sudachi flavor being too strong and sour and I wasn't sure how well the taste would blend together with the biscuit sticks. But I was happy when I was actually proven wrong, the sudachi flavor was surprisingly not as strong as I initially thought it would be, it was actually just the right amount for me. The sour & zesty flavor of the sudachi was milder than I had anticipated, but there was still a good amount of it to give each biscuit stick that kick of citrus flavor, and the flavor was still somewhat sharp to the palate without being overpowering. And I thought the milder but sharp citrus taste of sudachi complemented the biscuit sticks well. 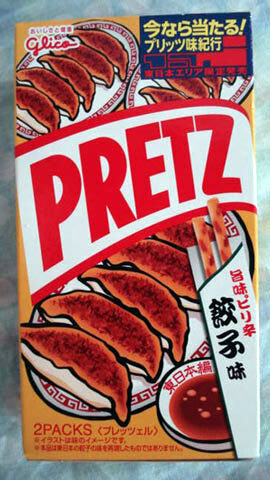 Overall, I was unexpectedly pleased with these sudachi flavored Pretz sticks, they were surprisingly very good. Sudachi is no doubt a very unusual choice of flavor for a commercial snack, but who cares, the taste does it justice and that's what's important! I can't wait to get my hands on more of these the next time I go to Tokyomart! I can start rambling on about how great Glico's 'Pretz' biscuit sticks snacks are and how much I love them, but I will refrain from doing so this time, since I have blogged about so many Pretz flavors already over the years, I'm sure I've at least expressed once before about my undying love for this irresistibly lip-smackingly oishii (yummy) biscuit sticks So yes, no ramblings this time. By the way, this review with be very short & brief because it's currently almost 3am here in Sydney and I'm very tired & eager to hit the sack...and don't even bother asking me why I've stayed up so late, it's a long story. I promise I'll type a longer review next time. 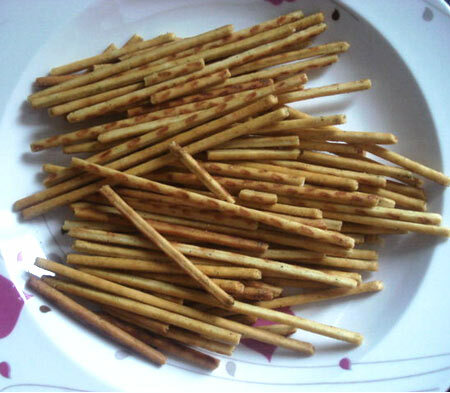 As always, the biscuit sticks were perfectly crispy & crunchy, the sticks as usual were also seasoned very generously and quite accurately, resulting in an explosion of lovely flavor for my taste buds to savor every time I munch on these yummy sticks. 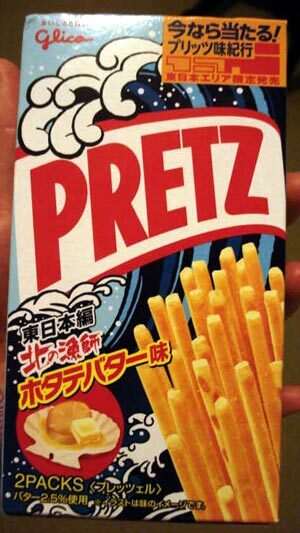 Glico never goes wrong with Pretz, and this is why it is one of the most popular & recognized Japanese snack brands in the world. Sorry I haven't been updating for a while...I've been quite busy this past week...I initially was going to update yesterday, but after hearing about the massive devastating 8.9 magnitude earthquake that hit Japan yesterday which caused a huge tsunami to sweep across the country, I was so overwhelmed with shock and worry for all my relatives & family who are living there. I spent much of the day yesterday trying to contact my loved ones, I'm still in a state of shock right now, and I pray for the safety of all the people of Japan. Because I'll be spending more efforts in much of today to contact my loved ones in Japan, running errands and babysitting my niece, this will only be a very short and brief review. these classic crispy and crunchy Pretz sticks were perfectly and accurately seasoned in a resealable bag to lock in the freshness. 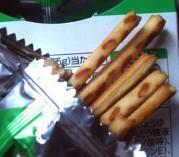 My only very minor complaint about it is that I felt there wasn't enough pretz sticks in the pack, I wanted more! I heard Ogura toast is a popular specialty from Nagoya, it's basically sweet azuki (red bean) paste spread on buttered toast...I've never tried it before, but it sounds yummy so I hope to try it someday. And since I'm oblivious to how Ogura toast is suppose to taste like, I didn't have much reference to judge on the accuracy of the flavors for the Pretz sticks...but since the flavor is suppose to be azuki paste on buttered toast, I assume some degree of azuki & butter taste were required. The pretzel sticks were crispy & crunchy as usual, but the real test were the seasonings...I couldn't really taste the butter, because it was too subtle...but I was able to taste the mild sweetness & flavor of the azuki, so at least they hit the nail on that aspect. Overall, it was a nice flavor, quite interesting...a little more butter flavor and it would've been just right...but I feel like this flavor is gearing more towards sweet, rather than the usual savory. 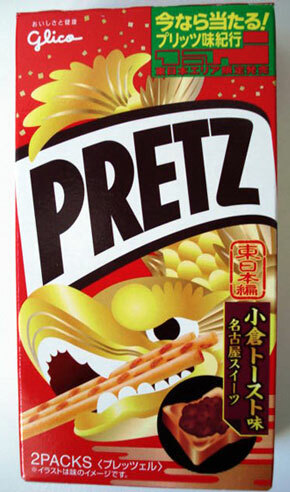 hotate (scallops) are very popular in north-eastern Japan, especially when flavored with butter...and that was the inspiration for this Pretz flavor. What can I say, I enjoyed this more than the Ogura toast flavor frankly...the seasonings brought out a stronger flavor of the scallop & butter, bringing the flavors to a higher level of accuracy for its respected flavor. 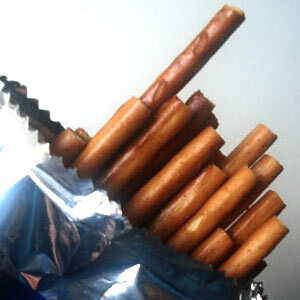 To the point that I was also able to taste that slight "fishiness" of seafoods (like scallops) with each pretzel stick. Scallops was the dominate flavor, although the butter taste was quite strong too. Overall, scallops & butter make a great combination, mark my words! And when partnered up with crunchy pretzel sticks, it spells 'delectable' all over it! in conclusion, I think these 2 flavors are well worth trying out! Especially if you love Pretz snacks (like me)! You can order these Pretz snacks @ NapaJapan. I love gyoza! My mum and I often boil or fry gyoza for lunch, sometimes I have them by themselves, and at other times they're accompanied with dipping sauce. 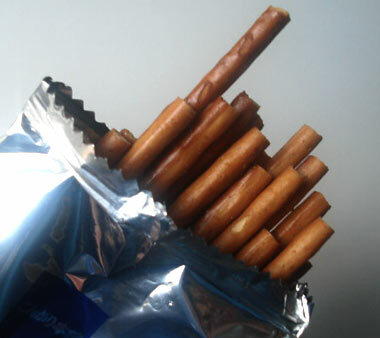 Normally they are dipped in sauce and eaten, and in this instance, when I tasted these pretzel sticks, I realized they had used a spicy sauce as a reference for the flavor. The whole intent of this flavor was to give the consumer the full flavor of fried gyoza already dipped in spicy sauce. I didn't quite like the spicy seasoning for the sticks, because I don't like spicy foods, so that sort of put me off a bit. Whenever I eat gyoza accompanied with dipping sauce, I make the sauce myself using a mixture of soyu (soy sauce), vinegar (white or apple cider) & finely crushed ginger...which isn't spicy, but rather a salty & sour sauce with a refreshing taste of ginger. So I actually didn't expect this to be spicy at all, I was rather surprised...and a bit disappointed. I guess the Japanese love their spicy sauce more, to each their own I suppose. Overall, it's not a bad flavor, I still quite enjoyed it...although I wasn't very happy with the spicy seasonings, but it wasn't terribly spicy either. as usual, these were absolutely delicious! 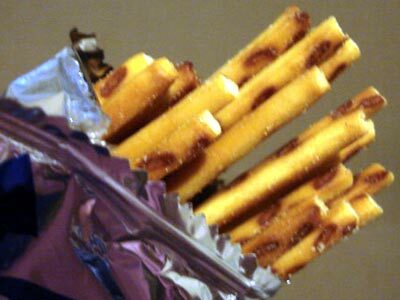 Each stick had a good amount of seasoning with very accurate and strong butter flavor, the pretzel sticks themselves were beautifully crunchy and crispy, like Pretz snacks always are! 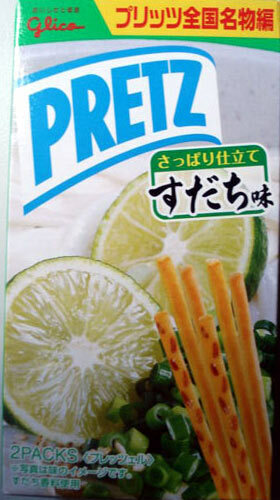 I have tried so many different flavors of Pretz, and honestly, these are among the BEST snacks I have ever eaten! Period! They're so good that they don't necessarily need all these fancy flavors, just give me these plain pretzel sticks with no flavorings whatsoever and it would still be irresistibly delicious! These different flavors & seasonings are just the icing on the cake! 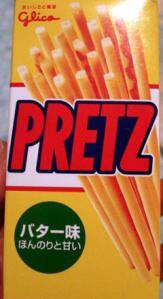 Ok, I admit, I have a HUGE obsession & craving for Pretz they're just so irresistibly good! Every time I dig into a pack of Pretz, I always have a hard time of holding back, and normally I would finish the whole pack in less than no time, because I just can't resist it! I can't put them away and save them for another time, if I open a pack of Pretz, I have to finish the entire box in one go! And this butter flavor was no different, I think I finished the entire pack in under 2 minutes! 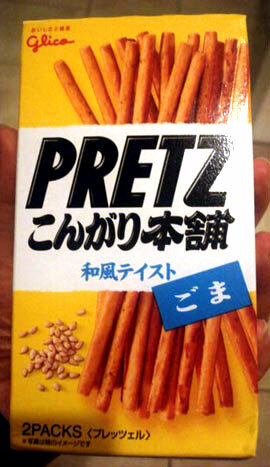 It's definitely one of my all-time fave Pretz flavors, highly recommended! 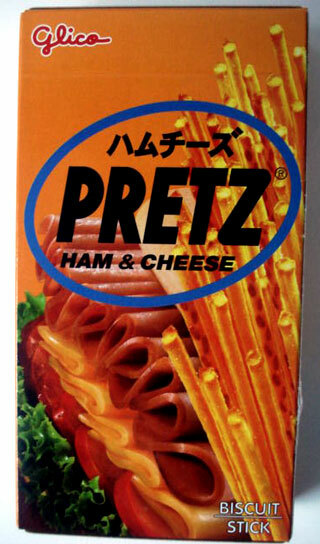 You can order Pretz, as well as other great Japanese snacks & sweets at NapaJapan.